We like to say Idaho is like Arizona was 30 years ago--back in the day when a six pack and a bug zapper was all the entertainment you ever needed. It doesn't take much to give people a little thrill up here in Tater Nation. Here's a prime example shown in the photo below. Think your way through the process that got this photo published in the SUNDAY newspaper. First, some guy named Rodney who lives over in Deep Freeze Country on the west slope of the Grand Teton Range had to be sitting around one day when the Bright Idea Bulb lit up over his head. Naturally, any idea this danged good would have to be shared. Let's imagine Rodney going to his wife or one of his best friends and saying, "Maude, I've got this really great idea and I bet the newspaper will publish it in the Sunday paper!" Well, the idea caught fire--it doesn't take much for people to get excited over there in Teton, Idaho. Pretty soon, Rodney had all sorts of accomplices in his plan. Why he even have not one but several ranges from which to choose. When the Big Moment arrived for Rodney to actually take the picture he had to have one of his Bubba neighbor friend work security and crowd control to restrain the crowd of 50 beer swilling neighbors from trying to get into the picture. If pictures could talk, you would hear them all guffawing and making wise cracks in the background. Some of them were undoubtedly even mooing like cows are wont to do on the REAL open range. Oh, how they laughed. Oh, the fun they had. Now then, Rodney gets his picture all ready for Prime Time and somehow gets it sent off to the Big City Newspaper. Oh, my, oh, my, what a commotion the photo caused when it arrived in the Newsroom. Hard-bitten news editors dropped their daily chores and crowded around the big screen monitor to ogle their latest find--The Open Range. Oh, how they laughed. Oh, the fun they had. Meanwhile, The Alpha Male there at the Big City Newspaper declared The Open Range photo was way too impressive to put in a mere week day edition of the newspaper. No. This photo had to be saved for the SUNDAY edition when everyone throughout ALL of Eastern Eye-Dee-Hoe would see it. 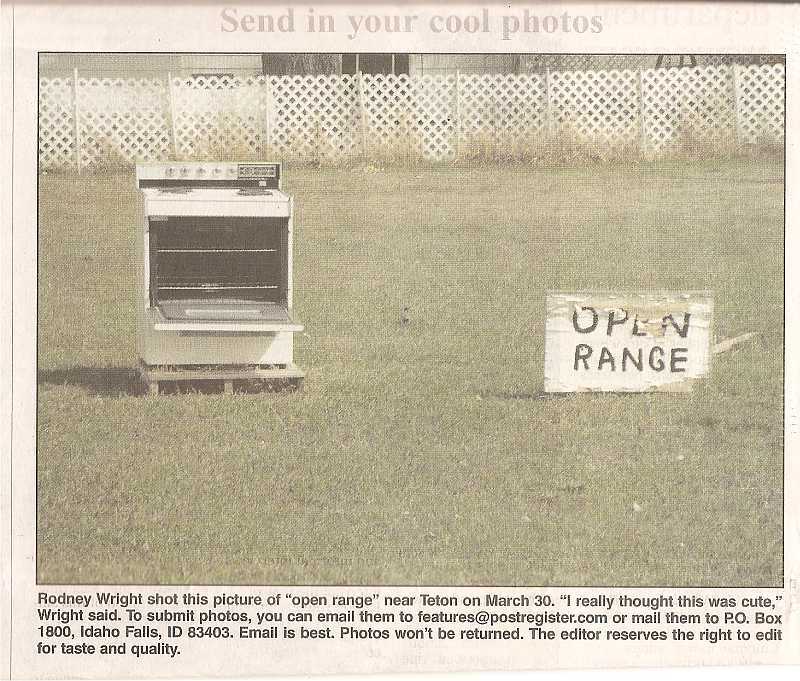 Sure enough, The Open range photo showed up in the May 6th edition of the Sunday newspaper and citizens and rubes alike all over Eastern Idaho rose up and took note. Oh, how they laughed. Oh, the fun they had. As we said earlier here, it really doesn't take much to entertain ourselves here. When all else fails, there's always The Open Range! Now if there was an animal in or on the range would it have been labeled: The Lone Ranger?